In an effort to make library ebook borrowing less convenient, Penguin Group has discontinued over-the-air library book downloads for Kindle users. Users will instead have to download books onto a computer, then transfer them to the device with a USB cable. In addition, Penguin has terminated its agreement with Overdrive, a library ebook distributor, which for now means Penguin won't supply any new ebooks or audiobooks to libraries. Penguin's reason for splitting with Overdrive is somewhat technical: Overdrive was apparently relying on Amazon to distribute the books to Kindle users, but Penguin's contract allowed Overdrive only to store and serve books on its own servers, according to Infodocket. But the bigger issue is that book publishers are worried about libraries. 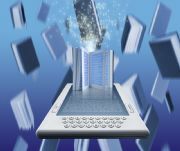 Random House is the only major publisher that gives libraries unrestricted access to purchase and loan ebooks. Other publishers place restrictions on how many times a book can be downloaded or when new books become available. Simon & Schuster and Macmillan don't lend ebooks at all. In other words, being able to download library ebooks is too easy. Penguin's USB download requirement could be a way to introduce friction. If you've ever actually tried to borrow a library ebook, however, you know that most of the friction comes from books being all checked out, not from the actual download process. Furthermore, by making users put a file on their computers, publishers are increasing the risk of ebook piracy. DRM-cracking software for library ebooks is not hard to find, and users may be tempted to lift lending restrictions as long as those files are passing through PCs. In trying to increase friction, publishers may end up reducing it for unscrupulous readers.